The birthstone of those born in April, the diamond is a favorite gemstone of women the world over, no matter what month they were born. Believe it or not, there are more to Plantation diamonds than you probably realize. As a matter of fact, here are seven facts about America’s favorite gemstone. In ancient times, it was believed in Greece that diamonds were the splinters of fallen stars on earths. These were thought to promote courage, invincibility and strength. Others thought them to be the tears of gods. In Rome, diamonds were worn as talismans as they were believed to ward off evil. In France, there was a 13th century law decreeing that diamonds could only be worn by the King of France. Diamonds come in shades of black, green, yellow, orange, red and blue. Believe it or not, white is just one color that diamonds come in. The rarest colors are pink, green and blue diamonds. Among gemstones, however, these are not the rarest. As a matter of fact the rarest gemstone is a pure red ruby. In 2004, a planet composed mainly of carbon and is a third made of pure diamond has been discovered. Found orbiting in the Milky Way around a star, the planet is named 55 Cancri-e. Essentially, what scientists have found is that the star is a diamond that is 10 billion trillion trillion carats. The star is also referred to as Lucy in the Sky with Diamonds, named after the song by the Beatles. The locations where diamonds can be found varied through the centuries. The original source of diamonds starting the 1400s was India. Indian diamonds were sold in European trade centers such as Venice. Three centuries later, there was a decline in the diamond supply of India and the major source became Brazil until the 1800s. These days, in many different parts of the world, diamonds are mined including Russia, Namibia, Botswana and Canada. Found in 1905 in South Africa, the largest diamond in the world is called the Cullinan. Its original weight was 3,106.75 uncut carats. Later it weighed 530.2 carats after being cut into the Great Star of Africa. Its other pieces became 104 diamonds of flawless clarity and color as well as the Lesser Star of Africa which weight 317.40 carats. At the moment, this diamond has become part of the crown jewels of England. Also found in South Africa, the Excelsior is the next largest diamond, which is a third of the size of the Cullinan. Another diamond called Unnamed Brown was unearthed in 1986 and is the largest polished diamond that has been documented. Unnamed Brown weighed 545 carats and was cut down from a rough diamond of 700 carats. Also part of the British Crown Jewels is the Centenary Diamond. This is an impressive diamond that took three years to cut. It is the largest flawless diamond in the world and weighs 273.85 carats. On the Mohs scale, the diamond’s hardness measures ten, which means that on earth, it is the hardest natural substance. As a matter of fact, these gem stones are so hard that to cut a tool the only tool that can be used needs to be made from another diamond. Within the crust of the earth, diamonds have been formed over a period of billions of years. It is in volcanic rock called Kimberlite that many diamonds are found. Volcanoes push them to the earth’s surface. At times, rivers carry diamonds that have been pushed to the surface into the sea, so you can find them in these places as well. The largest market for diamonds is in the US. America purchases more than half of the total quality diamonds of the world even if it produces less than 1% of the total gemstone production in the world. Are you in the market for a diamond? Whether you are looking for estate, vintage, antique or brand new diamond jewelry pieces in Princeton, Gray and Sons will help you find the perfect one. As a matter of fact, with thirty years of experience behind them, you can be assured that you are in perfectly good hands. Going to Gray and Sons Plantation Residents? While in the area of Plantation, Florida, you might want to buy and sell jewelry. 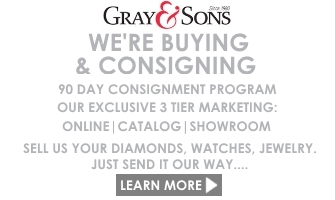 Whether you are in the market for new jewelry pieces for yourself such as rings, bracelets, brooches, necklaces, anklets or tiaras or want to sell some of your own, get the best appraisal from Gray and Sons. The qualified staff at Gray and Sons will gladly appraise all your pieces and give you customer service that can’t be beat. Why risk such an important purchase or sale? At Gray and Sons, you know you are in great hands. As the most popular form of jewelry, commonly associated with love and affection, there are 4 things you want to consider to make the purchasing diamond jewelry a treat: What type of diamond jewelry are you buying? What price range are you looking at? What style are you interested in? And most importantly, what size do you feel like buying? Engagement ring, bracelet, necklace, earring or tiara – size does matter! Aside from aforementioned considerations, it’s completely important to know who you are buying from. 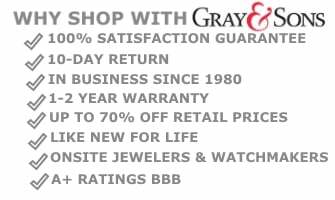 Sell Your Jewelry at Gray and Sons Plantation! Remember that a legitimate and experienced jeweler will always have your best intentions at heart. Having said that, if you feel uncomfortable with selling your jewelry to the person you’re currently talking to, we invite you to try out the Gray and Sons experience. With decades of involvement in appraising jewelry, we understand how emotional it is to part with your jewelry so allow Gray and Sons to make this experience an enjoyable one. Our jewelry experts will assess your jewelry at a fair and right rate.